It knows if you've voted already today - going back tomorrow to see if it still remembers me. As of the time I am typing this it's been about 6.5 hours since this thread started and the "Disagree" votes have gone up by 14. The votes agreeing with the NRA have gone up by 1238. I'm thinking that they are not getting the results that they desired. Do you agree or disagree with NRA gun policies? I wonder what they will do to try and make their side look better. I just voted. I don't even like the NRA and I voted for them. Take that liberal scum! HAHAHAHAHAHAHAHA!! You can vote again from the same computer (IP address I presume) after 24 hours have passed since your last vote It's almost up to exactly 2/3 for the NRA. As of Saturday, June 8th at 14:14 CST, 28402 have voted. 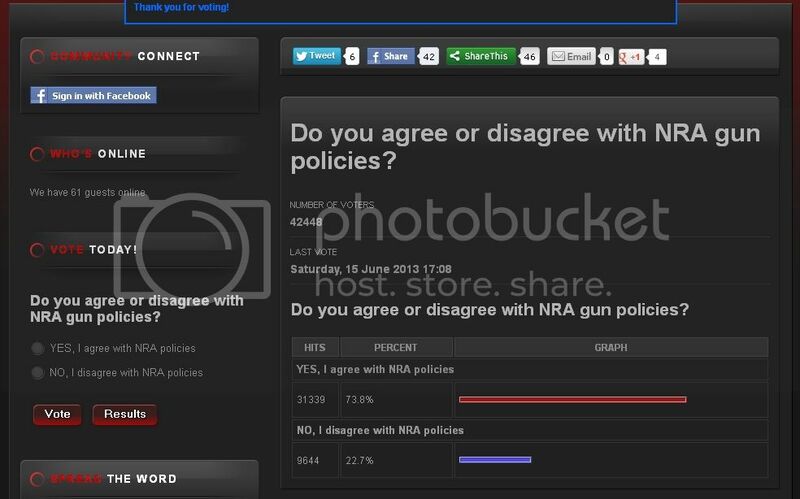 66.5% agree with NRA, 33.5 disagree with NRA. A 2-to-1 vote in favor of NRA. They will say that this is an unofficial poll & that NRA supporters voted multiple times but that those who disagreed with their policies only voted once. "Tell congeries how we feel: VOTE NOW"
:lmao: Now they're claiming the site was hacked on 6-8-13, and now the real count is being displayed. It's still at 65.3% for the NRA. It was at 66.7% Sunday. I just noticed that someone posted the link to this poll in the ILLINOIS Hometown Forum on AR15.com... I bet a TON of votes came from there. Now it's up to 73.8%. They're short by over 1400 votes on the percentages, though. Presumably those are the votes that were removed from the alleged hacking.